I have two big hobbies or lets just even call them obsessions. This blog explains one of them, the other is for typography. It all started out with me simply collecting type books and and magazines. This has snowballed into me now trying to in the long term forge a career as a type designer. I have only just began falling down this rabbit hole on my quest but I thought I would get myself the best tools to help aid this. 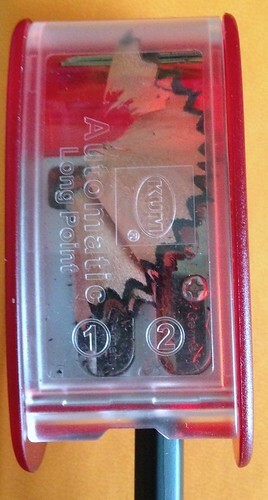 Enter the KUM Automatic Long Point Sharpener. 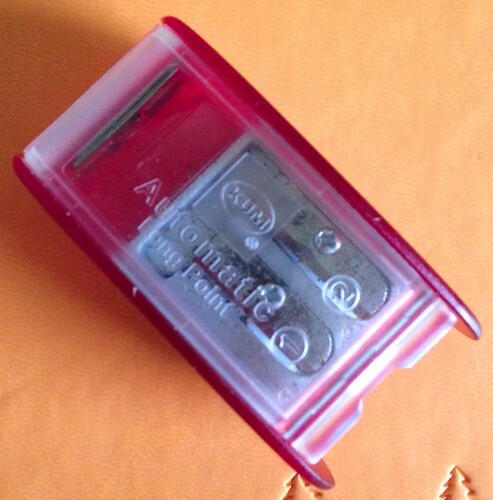 When I was in Primary School, pencil sharpeners were very much a standard item in my pencil case. They done exactly what they said on the tin, it would sharpen a pencil. Fast forward to the present and they still do this basic purpose but now on a much cooler scale! I can’t really remember how I came across the KUM Automatic Long Point Sharpener, I think it might have been via youtube (I will include the demo video at the bottom of this post). After watching this video a few times I knew I had to get one for myself. It was very easy to find one via Cult-Pens and it only costed me a respectable £4.00. 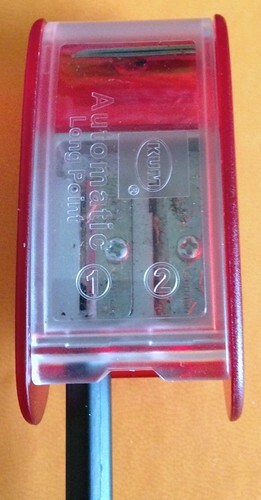 The KUM Automatic Long Point Sharpener is made of a strong plastic material. The main body of plastic is a transparent red colour were the top is a clear transparent plastic. This is very handy as it lets you see if it has become full from pencil shavings. To sharpen a pencil this is done in two stages. This strips away the wood of the pencil to just exposed the pencil lead. This sharpens the exposed lead in to a very fine point. It takes no time at all to complete both stages and what you end up with each time is a very fine lead tip. I have only had mine for a few days and I love it, it just does the job really well. A nice touch is that it also comes with a set of replacement blades for both stages. Overall I have been really impressed with the KUM Automatic Long Point Sharpener and I really recommend that if you write or sketch a lot with pencils to invest in one.